Over the course of the History 4001 class trip to Chicago, I’ve seen sights and visited places I’ve never had a chance to in my hometown of St. Louis. Since we in Dr. Schramm’s class arrived in Chicago last Sunday, we’ve been greeted with skyscrapers and apartments of many different heights as we went on various immersive tours hosted by organizations such as the Chicago Architecture Foundation (CAF). The CAF building is no more than three blocks away from Roosevelt and is a gateway into Chicago history. One of these tours took our group to Frank Lloyd Wright’s home and studio, as well as the surrounding neighborhood. This tour was of special interest to me since I consider Wright my inspiration and reason I’m interested in architecture. Though his designs were initially influenced by Louis Sullivan, his mentor, (though Wright may be loath to admit), his later projects invoke an Asian flair, with more natural tones and level roofs. What’s more is that he also created most of the furniture in the houses he designed. This was evident in the Robie house in Oak Park, which we toured last week. The house is considered Prairie Style, an American architectural style new in the early 1900’s that mimicked the vast prairie landscape of the countryside. The tour itself gave great insight as to how both Wright and his wealthier clients and their families lived in the late 1800s and 1900s, how the societal standards changed over time and affected the location and even inclusion of rooms that we may not have today. Each room and each piece of furniture of Wright’s homes contributed to his ideals of the close family unit and closeness to nature, whether that meant high-backed chairs to keep dining isolated from exterior distractions in the Robie house, or designing an entire room to accommodate for a tree’s path as in his own home and studio. Another great tour we took was a river boat tour. We couldn’t have picked a better day as the sun’s warmth finally shone through after a week of colder weather. 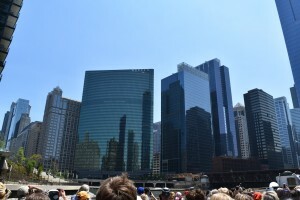 This tour meandered through the skyscraper valley of Chicago, highlighting the many styles and eras of architecture throughout the city’s history. It gave a new angle of the city and a look into how the city operated and progressed from the past. It was interesting to hear (again) how, over a hundred years ago, engineers managed to reverse the flow of the entire river in order to clean Lake Michigan of the debris and waste that had been collecting. Overall, the river boat tour was a nice and relaxing way to spend the day after a week of walking. 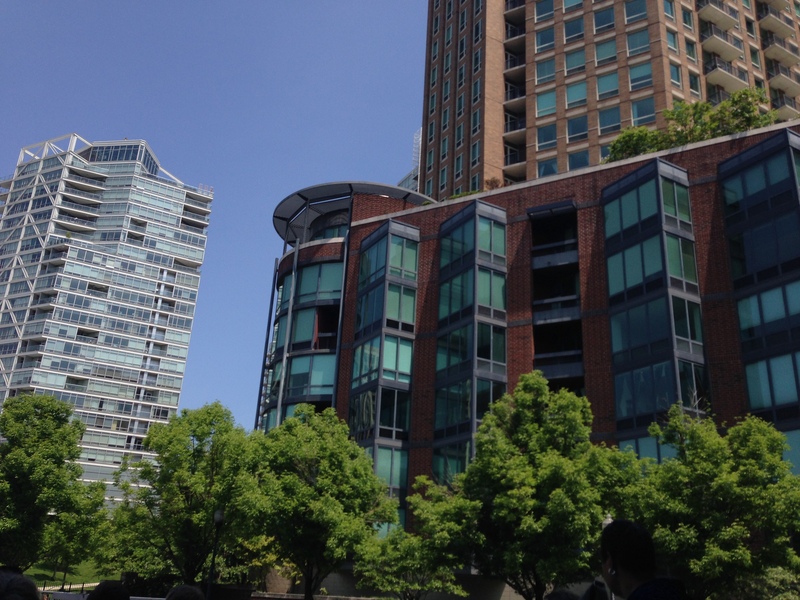 During another tour in the city near the Aqua, there was a small community I really liked because of the modern architecture and how closed in and safe it seemed. 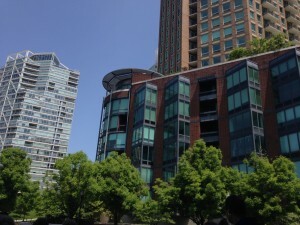 A park and dog park were in the center and was encircled by nice-looking apartments on the lower level and restaurants and shops on a higher level. If I lived in Chicago, this might have my ideal place. 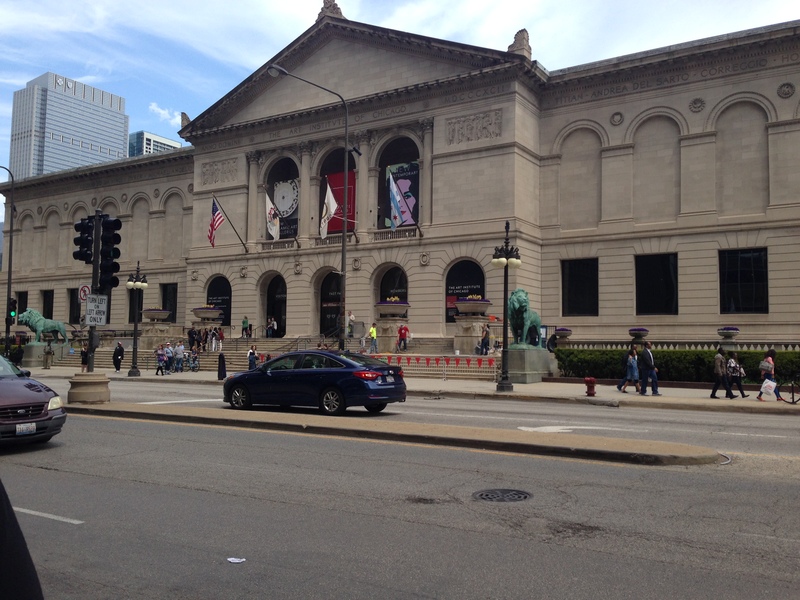 Over the weekend, I had the chance to visit the Art Institute of Chicago, where they are able to immerse you in artwork and history with audio and extensive collections of art from all corners of the globe. My favorite section had to be the East Asian, specifically Chinese, art, which included works from ancient carvings and statues to dynastic paintings and pottery, but the entire museum had enough art to keep you exploring for hours. While not on tours or sightseeing in the Chicago neighborhoods, our class is staying at Roosevelt University, named for the titular President’s progressive ideals. The modern structure itself hosts amazing skyline views of both the city and Lake Michigan throughout the day, a view I can hardly find in the suburbs of St. Louis or Rolla. The whole building strives to be more eco-friendly, with LEED awards and recycling bins in nearly every room. It’s a nice change from Rolla, where some buildings could, well, use some renovation. Roosevelt is a great example of how far Chicago has come over the past century alone. From a swampy region to skyscrapers extending into the clouds, Chicago continues to exceed expectations as it continues into the future.